Visual and performing arts teachers are especially strong in this area because of the performance-based nature of their subjects, and since celebrating arts/performing/presenting/producing is one-fourth of the National Core Arts Standards. Classroom teachers who are integrating the arts programs should seek out these authentic audiences as an important and effective tool, too. Authentic audiences are a win-win for everyone involved. Not only are they tremendously beneficial for engagement, confidence, and achievement, but they also build advocacy for our programs. It is important for us to share the amazing things that are going on in our schools so that community members, who might not have family members in our schools, can see (and hear) what’s going on. This is huge when budgets start getting cut. When people are aware, they can support the arts or projects. Having a partner in the community might help with funding and support of projects. Taking and celebrating arts programs outside of the school walls can also help us find community members that help to bring more art into our schools. Building these community partnerships can help us find teaching or performing artists that can enrich the academic arts experience for students. Reaching Out is Daunting, but It’s Quick and Easy! “Building community partnerships” sounds like a huge task that should be handled by an administrator or a community outreach professional. However, as a teacher, it is not hard to do! I keep my eyes open for opportunities to display or share my students’ work. In my community, a local university was interested in displaying student artwork on a rotating basis. I sent an email, and the next month, our art was on their wall. In addition, my students and their families had an opportunity to visit their gallery as well as meet with art professors. What an experience for them! I have reached out to local art museums, restaurants, and even our public library, who will catalog and shelve books that my students write. I include a description of the arts integrated project so that families who sign out the book can be as impressed as I am at the complex work that my students produce. Performances during the school day can be tricky due to limits on transportation and the need for chaperones, funding, etc. I have found community events to be easiest to pull off during evenings and weekends so that I can count on parents for transportation. Of course, this has a tendency to limit involvement for students whose parents are unable to provide support. Towards the beginning of the school year, I try to form a network of parents that can help to carpool to events like these so that students who want to participate, can. These community events are optional since they are outside of the school day, and I have to be flexible about planning since I can’t depend on having every student at the event. 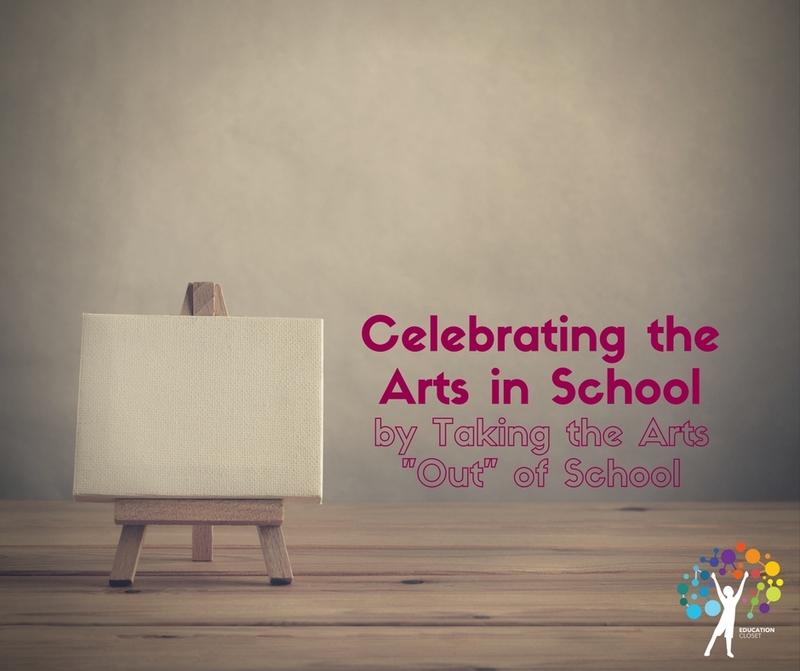 However, even if I have a small group of students along, taking and celebrating arts out of the school is effective for the students and the community partner. Each year, my school also celebrates the arts with an Arts Night. This is a great opportunity to showcase all of the arts programs that the school offers – either outside of the school day or within the school day. We provide a few performance opportunities for our students this evening through a student art show and a short concert by our violin students, but the evening is mostly comprised of sessions led by community artists, musicians, dancers, and actors. We also partner with high school teachers, who bring student musicians and artists, showing our elementary students what they have to look forward to if they decide to follow an art path as they work their way through their school career. I have found that through a simple, personal email to each community organization I am interested in working with, I am building mini-partnerships. Almost all are willing and excited to join in an event that supports the arts by sharing their expertise with our elementary students. By visiting our school and meeting our students and their families, these community artists recognize that our school is committed to the arts advocacy in school. It also gives me an opportunity to meet artists that might work as teaching artists for our yearly residency. I find even more ideas for taking my students’ work out of our building as I talk with our visiting artists. This cycle of partnership helps our program to grow from year to year. Local colleges and universities: partner with art, music, dance or theater departments. They may already have programs in place for displaying or presenting work, and they are an amazing resource for teaching artists or performing groups. Local art galleries and museums of all types: These types of organizations may be able to display student work. We even have a local science museum with a rotating STEAM gallery and a tiny local history museum that displays an arts-integrated research project our elementary school does on Charles Demuth, a local artist. Local restaurants, businesses, and doctor’s offices: These locations are perfect for displaying student art. If it is too cumbersome to deliver and set up the artwork, consider a digital frame. Email pictures or send a flash drive of student work to be displayed on the frame. Local theaters: Arrange for students to perform in the lobby prior to ticketed performances, especially if students are studying something that relates to the show. This could be an incredible arts-integrated project and could turn into a partnership. Public libraries and recreation or community centers: Libraries can feature student work, even as a rotating screen saver on library devices. Community and recreation centers, as well as libraries, typically have free community programs. Let them know that you have a performing group that could participate in events. Even better: when you read about an event that relates to your content, share the connection with the organization and explain how you can complement it. For example, our library was hosting a guest speaker on the local history of the underground railroad, and our music class was learning about the music of the underground railroad. Having our class perform just before or after would have promoted their speaker as well as provided an interested, authentic audience for students. Train stations and airports, or anywhere with a display case or lobby: These types of locations are great for displaying social studies projects related to local history. They are also filled with waiting travelers who would be a captive audience for young performers.